You can change the addr target in Ratel. 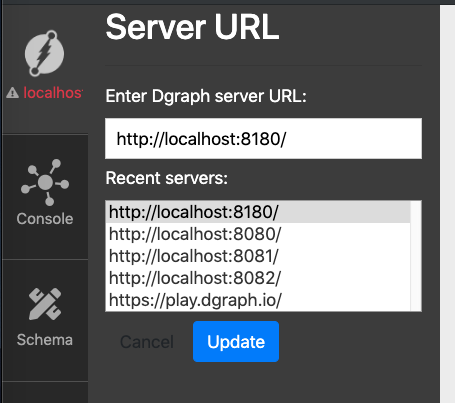 In “Dgraph server URL” you have to use the HTTP address and port of your Alpha. Certainly it is 8080 (localhost) otherwise your Alpha is in trouble. I’ts not ready. Check your logs. 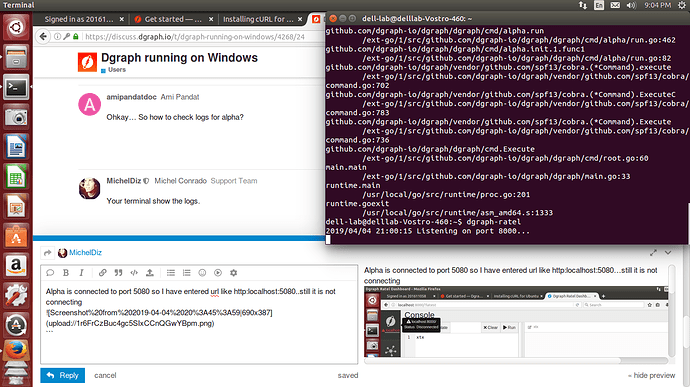 Ohkay… So how to check logs for alpha? Your terminal show the logs. No, only 8080 port should be used on Ratel input field “Dgraph server URL”. 8000 is to access Ratel itself. In windows it is showing same error. Well, I will see ports usage and will let you know if I find any error. Play.dgraph.io is showing error that mutations are not allowed. Is there any way to resolve that error? Play Dgraph points to our servers that contains sample datasets. In it the mutation process is prohibited. If you are receiving this error, it is a sign that you have not changed the address in the input field correctly. Explain in detail what you are doing, all context. Only then can I have an idea of what to guide you. On ubuntu I have installed it by using curl command and then type dgraph-ratel only…thats how I have done. In short, I am missing some steps at the time of initialization which reflects in ratel connection to localhost. Well, I still do not understand your context. But I’ll summarize here what you need. 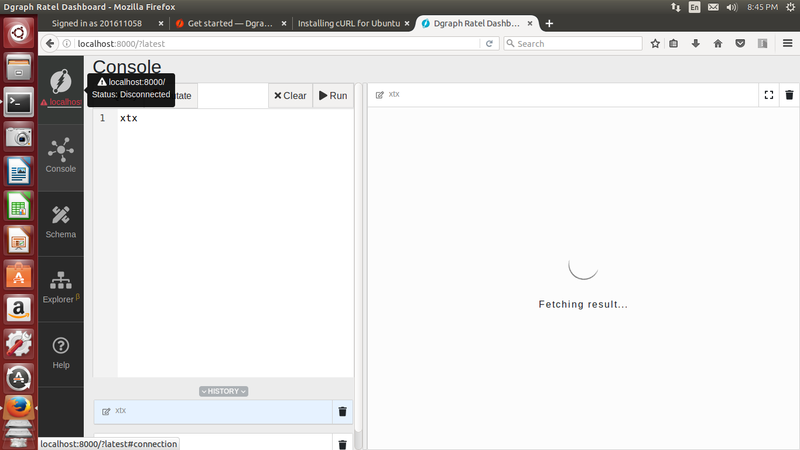 Dgraph Ratel UI needs to access the HTTP port and usually is 8080. The address must be accessible and the port must be accessible as well. Then analyze firewall and other parameters of your operating system in relation to this. If you are using virtual machine, you need to check forwarding and so on. These things are outside Dgraph’s scope. 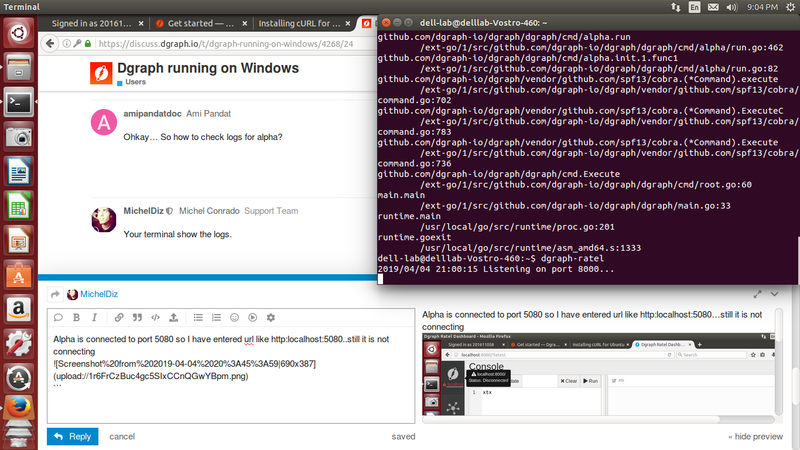 Having a Dgraph Alpha Group (Zero and Alpha) running. You can access it normally. There’s no secret. If you are trying to create an HA configuration for example, distributed. I recommend analyzing YAMLs of that type. Below is a schematic of how a Dgraph distributed organization is. OKay .I got your point. But I am just not able to connect it to localhost. I dont know why? From two days I am facing same error.